November 15, 2008 July 22, 2018 - 2 Comments. It’s unlikely the Taos Chamber of Commerce ever used that New Testament passage to lure visitors to Taos, but it would have made an excellent tourism slogan. Taos, New Mexico seems to have a mollifying effect on weary souls. It has been easing burdens and removing the yoke of the heavily laden for more than a millennium. Taos calls its visitors to spiritual odysseys, to commune with incomparable beauty and serenity, to imbibe the exotic melting pot of cultures. It has inspired dazzling creativity and intoxicated legendary artists such as D.H. Lawrence, Georgia O’Keefe, Mabel Dodge Luhan and Willa Cather. Some have, in fact, described Taos as being more a state of mind than it is a location. That state of mind would be a little unconventional–relaxed and informal with a “live and let live” element. It’s that element which has made Taos a haven for counter-culture, an accepting habitat for hippies. Taos does not follow the normal rules of society. It is Bohemian in every respect. You’ll experience that Bohemian spirit as you turn off Paseo del Pueblo onto a gravel driveway and past a converted home to the restaurant out back, the back of the property, that is. The restaurant looks like something out of one of the old hippie communes prevalent throughout Taos county in the 1960s. Exterior construction is reminiscent of a converted simple wooden shed. There is no gaudy signage or flashing artifice to greet you. Tables and chairs are strewn throughout the yard as if the remnant of a drunken party or, more likely, a typical New Mexico wind. Vintage metal signage for A&W and other period piece advertising is tacked onto the wooden fencing. There are several 1940s style gasoline pumps on the grounds. Step inside on a cold winter day and the heat of a gas log fireplace envelops you like a warm hug. Seating in the front room is limited, but the large picture window makes it a preferred venue. Seating is also limited in the main dining room where a view to the open kitchen is available. Showcased behind a glass display case are some of the most scrumptious looking pastries you’ll ever glimpse. The restroom walls and the restaurant’s tables are lined with butcher paper and crayons are provided perhaps to inspire a new generation of Taos artists. The atmosphere shouts fun. The wait staff, a mix of local students and Bohemian twenty-somethings, is as friendly and accommodating as possible. Best of all, they don’t hover over you impatiently. Order at your leisure. It’s going to take some time to figure out what you want from among all the intriguing choices (in fact, the menu’s top banner reads “delicious decisions….decisions….decisions….decisions (you get the point). Ask other diners and they’ll confirm that everything is good. There’s a lot more on the menu than the name on the marquee (if the restaurant had one). In addition to customized (you choose the toppings) and specialty pizzas, you can choose from a selection of calzones, pasta dishes, soups and salads. The salads feature a homemade basil-parmesan vinaigrette dressing that is simply amazing, easily one of the best salad dressings we’ve had in the Land of Enchantment. If it’s been a long time since you’ve been excited by salad dressing, it’s a guarantee this one will change that with your first taste. You get two small cream pitchers full of the stuff with each large salad. The “basic salad” comes with a selection of organic greens (from a local greenhouse), julienned carrots, red cabbage, alfalfa sprouts and purple onion. Order a Greek salad and added to the aforementioned plentitude are feta cheese, Greek olives and pepperonici. The Greek salad is a welcome departure from most we’ve had in New Mexico (which tend to be an uninspired mix of iceberg lettuce, feta cheese, tomatoes, feta cheese drenched in olive oil). It’s a Greek salad several orders of magnitude more creative and better than perhaps any other in New Mexico with a melange of fresh and delicious ingredients. Two small slices of focaccia come with each large salad. The focaccia is a precursor to just how good the pizza is. If it is pizza you’ve come for, the Taos Pizza Out Back’s pizzaioli artisans toss a mean pie, maybe the best in the state. The pizza starts with a perfect canvas of organic flour pressed into a thicker than thin sheet of deliciousness. The edges are braided and seasoned then topped with toasted sesame seeds. Cheeses are tucked nattily under the breaded edges, a true stuffed crust pizza (eat your heart out Pizza Hut). Customizing a pizza is an adventure in creativity. Gourmet toppings include anchovies, artichoke hearts, fresh basil pesto, capers, smoked salmon, toasted walnuts and so much more, but why craft your own pizza when the Outback’s specialty pizzas are time-tested and certified “best in Taos” every year since 1999. One of the best pizzas we’ve ever had in New Mexico (or anywhere else for that matter) comes from that awesome assemblage of specialty pizzas. It’s the Southwest pizza, a masterpiece of basil pesto, Feta cheese, green chile, smoked Cheddar, roasted garlic and tomato. Perhaps conspicuous by their absence are tomato sauce and mozzarella. There are several pizzas with no tomato sauce, but you won’t miss it when the alternatives are basil pesto or honey chipotle chile sauce. There’s even a true white pizza with no sauce whatsoever. The menu also includes several vegetarian friendly pizzas. Smoked Cheddar and Feta cheese make for a bold departure from mozzarella. It goes without saying that Smoked Cheddar has a smoky taste, but the cold smoke seems to impart a bit of sweetness without diminishing the sharp flavor. Feta just makes everything better. The texture of the crust is unique, more bread-like than chewy and those sesame seeds are just terrific. Not surprisingly desserts are fabulous, and as if you don’t pile on enough calories with the pizza, decadent and rich. The cannoli, for example, isn’t just a fried pastry tube stuffed with a creamy Ricotta filling. 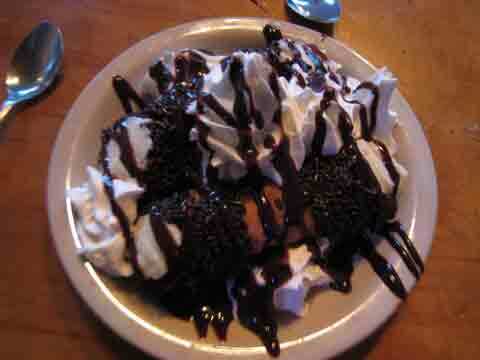 These are topped with homemade whipped cream, chocolate sprinkles and chocolate sauce. Each bite is an adventure in sinful bliss. 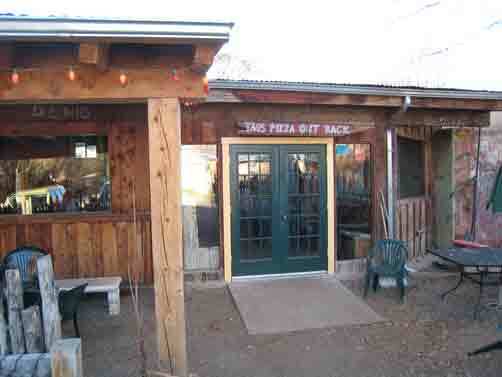 The Taos Pizza Out Back has been pleasing pizza loving palates since 1999. It was originally called Outback Pizza, years before some lousy “Australian” steakhouse, but was sued for trademark infringement and changed its name. By any name, it would be fun and funky, brash and Bohemian. It would be truly Taos. Just had this pizza for the hundredth time and still enjoy it. kinda slow to prepare it though.